On 27.06.1992, one day before the famous Serb Holiday “Vidovdan” around 70 Bosniak civilians mostly women and children were forced into the house of Meho and Dervisa Aljic in Bikavac settlement, stripped of their jewelry, barricaded and set on fire by Bosnian Serb soldiers gathered around the unit “Avengers” commanded by Milan Lukic . The only person who survived was Zehra Turjacanin. This year for the first time, this massacre was marked by victim families. The site were Meho Aljic's house used to stand.Copyright by Dnevni Avaz. This piece of fence is the only thing left which remainds people of Meho and Dervisa Aljic’s house. Esad Tufekcic's wife and two underaged children were burnt alive that night on Bikavac by Bosnian Serb soldiers. Esad Tufekcic’s wife Dzehva(28 years old), daughter Elma (5 years old) and son Ensar (1.5 years old) were burnt alive that night on Bikavac hill. The site were Meho Aljic's house used to stand and Mujesira Memisevic, a person who witnessed the crime from nearby.Video footage by FTV. After the crime was committed the house was destroyed by Bosnian Serb soldiers. One piece of fence is the only thing that today remains of Meho Aljic’s house. Mujesira Memisevic, like many others, watched the house in flames, listened to the cries of women and children. She later on visited the crime scene and witnessed burnt body parts. Meho and Dervisa Aljic, the owners of the house were the crime was committed.Video footage by TVSA. The owners of the house were not in Visegrad when the crime was committed, they were shocked to hear their house mentioned on the news. It is still very hard for them to visit their property. Serb neighbours nearby claim that they do not know anything about what happened on Bikavac that 27 June 1992. They refuse to tell victim families where the remains of the victims are. 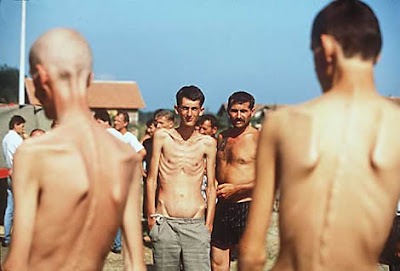 Prisoners at Trnopolje concentration camp in Prijedor Municipality 1992. There are reports of 21 Serb-run camps established in the Visegrad region as part of this «ethnic cleansing» campaign. They were first created in April and May 1992 and appear to have run throughout July and August, although most of their precise dates of existence are unspecified. These camps are as follows: Banja Suse, Bikavac Hotel, a building above a tunnel, a factory in Visegrad, the fire station at Visegrad, the former police station in Visegrad, Hasan Beretovac Primary School, Hasan Veletovic Primary School at Gucine, Pozarnica Barracks, Prelovo Camp, stable of Guso Salko, Varda Sawmill or Plant, Vardiste Barracks, Vilina Vlas Hotel, Visegrad Electric Plant, Visegrad High School Centre, Visegrad Sports Centre, Uzemnica or Uramnica Barracks, the Zelimir Djuric Zeljo Primary School in Prelevo, and Zamjenica Garrison. There are also reports that prisoners were held in private homes and apartments. Building above tunnel in Visegrad: (The existence of this detention facility has not been corroborated by multiple sources.) There is one report that girls were taken by «Cetniks» and detained in «a building above the tunnel» in Visegrad. *4249 There is no further information about this camp. Factory in Visegrad: (The existence of this detention facility has been corroborated by a neutral source, namely the Defence Debriefing Team.) The Defence Debriefing Team reported the existence of a camp at a factory in Visegrad in December 1992. *4250 No other details are included. Fire Station in Visegrad: (The existence of this detention facility has been corroborated by multiple sources however none among them are neutral.) The fire station at Visegrad was one of the main detention facilities in the area. There are no indications of exactly where in Visegrad this fire station is located; it is only described as having a «big open area» below it. *4251 Most prisoners at the station came from Zlijeb and Visegrad although there is a report that a group of young girls came from Kuke. *4252 Those from Zlijeb arrived sometime in June after the attack of their village by Arkan’s units. *4253 The exact dates of the other groups’ detention are unknown. Hasan Beretovac Primary School: (The existence of this detention facility has been corroborated by multiple sources however none among them are neutral.) There is a report that a Serb-run camp was established at this school. *4276 There is no further information. Hasan Veletovic Primary School at Gucine: (The existence of this detention facility has not been corroborated by multiple sources.) There is also a report that a camp was established here. There are no details about it other than the fact that the entire population of Crna was brought here, stripped of their valuables, and detained. *4277 This may, in fact, be the same camp reported above as Hasan Beretovac School. High School Centre at Visegrad: (The existence of this detention facility has been corroborated by multiple sources however none among them are neutral.) A camp was established at the high school in Visegrad. *4278 There is no indication exactly where the high school is located, and no other information is included. Former JNA Garrisons at Vardiste: *4279 (The existence of this detention facility has been corroborated by multiple sources however none among them are neutral.) There are reports that a camp existed at the former Vardiste military garrisons. *4280 No additional information was provided regarding this facility. Pozarnica Barracks: (The existence of this detention facility has not been corroborated by multiple sources.) There is a report of a camp at the Pozarnica Barracks. *4285 No information regarding operation or control, duration or existing conditions was provided about this facility. Local Stable: (The existence of this detention facility has not been corroborated by multiple sources.) Muslims are said to have been arrested by an identified man and held in the stable of a certain other identified man. *4289 They were arrested and brought to the stable on 24 June 1992, but there is no indication as to how many were there or how long they stayed. Uramnica or Uzemnica Barracks: (The existence of this detention facility has been corroborated by multiple sources however none among them are neutral.) Upon the initial attack of Visegrad, Muslims were ordered to gather at the Uramnica Barracks where they were held for three days. *4290 The report does not give a precise date of their arrest, but it was near 17 April 1992. Their destination after Uramnica is unknown. Once this camp became well-known it was moved. *4316 There are no details as to when this move took place or to where the camp relocated. Zelimir Djuric Zeljo Primary School at Prelovo: (The existence of this detention facility has not been corroborated by multiple sources.) There is alleged to have been a camp at this primary school. *4321 This may be the same camp described above as Prelovo Camp. It was a clandestine operation that Tabakovic and the villagers conducted in the dark and quiet of night to avoid the Serbian snipers surrounding them on all sides from the hill tops. Together, some 50 villagers organized a secret volunteer brigade to haul the bodies out of the river and bury them unnoticed. A couple of the men were from Visegrad and could identify some of the bodies. “For me, the most terrible experience was when one 20-year-old boy recognized his mother’s body floating in the river,” he said. Excerpt from “Has Anyone seen Milan Lukic? “, Anes Alic & Jen Tracy, 7.9.2001. Above: Bosanska Jagodina is located towards the Serbian border. In 2006. their remains were found in a mass grave in Crncicima. According to the Commission for missing persons in B&H the following were excecuted that day : Bajro Murtic, Smail Racic, Hidajet Račić, Mirsad Veletovac, Kemal Maluhić, Sead Šuško, Midhat Kasapović, Avdo Veletovac, Ahmo Kadrić, Esad Tabaković, Bajro Beširević, Mehmed Džagadurov, Hamed Zukić, and one person with the surname Kasapović from the village Žagre near Višegrada. Visegrad-Provocation at burial of 9-month old baby! Smaili Memišević, Ibrišimu Memiševiću, Medihi (Memišević) Ahmetspahić and 9-month old Amela Ahmetspahić. The night before, unknown persons placed a brutally killed dog next to the planned burial place of 9-month old Amela Ahmetspahic. Victims and family members were shocked when they saw a decaying dog in the cemetery obviously a provocation by the same people who murdered these 4 civilians. Federal TV footage of the brutally killed dog place next to the planned burial site of 9-month old Amela Ahmetspahic. This sickening act reminds us of the dehumanization of Bosniaks during the Genocide in 92-95 when Greater Serb ideology and Serb media portrayed Bosniaks as animals, insects etc. For example Bosniaks in Vlasenica were portrayed by Serb media as “lice” and that they as such, should be killed. Proof that this was a planned action by Serb facists is also the stoning of the Careva mosque in Visegrad(the only reconstructed one, all the mosques in the Visegrad municipality were dynamited). Windows on the mosque were broken by unknown persons the night before the burial. A religious ceremony was planned to take place in the mosque for the victims that day. Photo of women and children in street together: A Muslim veiled woman, Zejneba Hardaga (right) and Jewish woman, Rivka Kalb (2nd from right) and her children are guided on the streets of Sarajevo in 1941. Zejneba covered the yellow star on the Rivka's left arm with her veil. Bahrija Hardasa, sister-in-law of Zejneba, is on the far left. Courtesy of Center for Holocaust and Genocide Studies, University of Minnesota. Serb propagandist Bosnian genocide denial websites, oftenly publish lies about the role of Bosniaks in WW2. What they forget to mention is the role of Serbia’s puppet regime under Milan Nedic which was the first to proclaim itself “Judenfrei” in Europe. The National Library in Sarajevo, shelled and set on fire by Bosnian Serb Army, destroying over 2 million books. Luckily the Haggadah was saved. Bosniaks saved the Haggadah twice!. First in WW2 and in 1992 when the Bosnian Serb Army shelled the National Library in Sarajevo destroying millions of books in an aim to erase Bosnian culture. Once again, it was saved in a mysterious way. The hero this time was Qr. Enver Imamovic, the director of the Museum, who, along with a couple of brave policemen and members of the territorial guard, took out the Haggadah from the Museum immediately at the front line and moved it to the vault of the National Bank. During the war in Bosnia and Herzegovina several newspaper articles around the world speculated that the Haggadah had been destroyed or even that the Government of Republic of Bosnia and Herzegovina sold it and used the funds to buy arms, which was all-an untruth. By 1995 Bosnia was no longer high on the agenda for media around the world. We were left to bleed and die, and the media went on to deal with other topics. Then an idea to bring back attention of the world to Sarajevo by using Haggadah was born. Senator Lieberman said: “I will come to Sarajevo for Passover if the Sarajevo Haggadah will be on the table”. President Izetbegovic and Prime Minister Silajdzic accepted the idea and the Haggadah was brought to the Jewish Community Building for the Passover of 1995 under massive security measures. The event was noted by all news agencies around the world and quite a few sent their reporters to Sarajevo especially for the occasion. The event was the “Breaking News” for CNN, but Senator Lieberman did not make it to Sarajevo because of the tight siege and the closing down of the airport. What Bosnians have known the whole time can finally be proven. War criminal Ratko Mladic has been living in Belgrad all these years, with full knoweledge and support from the Serb government.